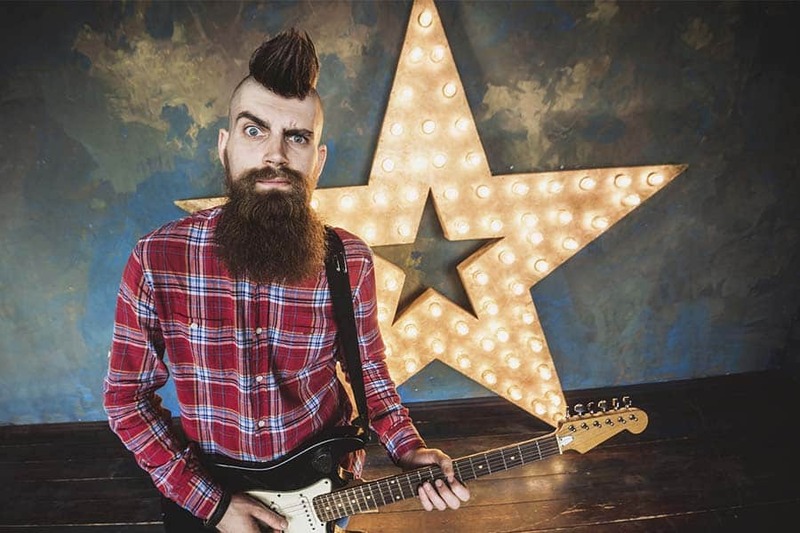 Rock Stars Prefer The Terrific Mohawk Haircut, Not For Nothing! The mohawk haircut is known for its outstanding, rebellious look. Check out how its modern variations look like and see how to wear them today! Nowadays, mohawks are not all about the bold statements; they’re about suiting your image. See how you can tame the restless cut and make it fit your own style! Mohawk vs Faux Hawk: What The Difference? The mohawk haircut, which came after the daring Iroquois haircut, used to leave a punky impression for those who saw it. And once a modern, grown-up man has a look at its classic variation, he probably won’t go for such a high-maintenance, rebellious cut. Thanks to the nowadays’ trendsetters, mohawk has gained the needed variability. And now, this cut can provide you with lots of contemporary approaches that you can wear for any occasions possible. The history of mohawk is not over! First, it was popular with native people of North America. Then some punk rock stars from MTV made it a thing. Today, this cut can suit anyone: from careless teens to presentable businessmen. And our staggering ideas will show you how it works these days! Initially, mohawks were famous among restless guys with disobedient attitudes, which is why this cut is always referred to as punk hair. Their dramatic appearance is the main reason why the cuts are still in the spotlight: they feature the contrast of the shaved sides and an outstanding, long strip of hair that runs from the hairline to the back of the head. Though the top is usually spiked for a more eye-catching look, the styling can be more diverse, modern, and practical. 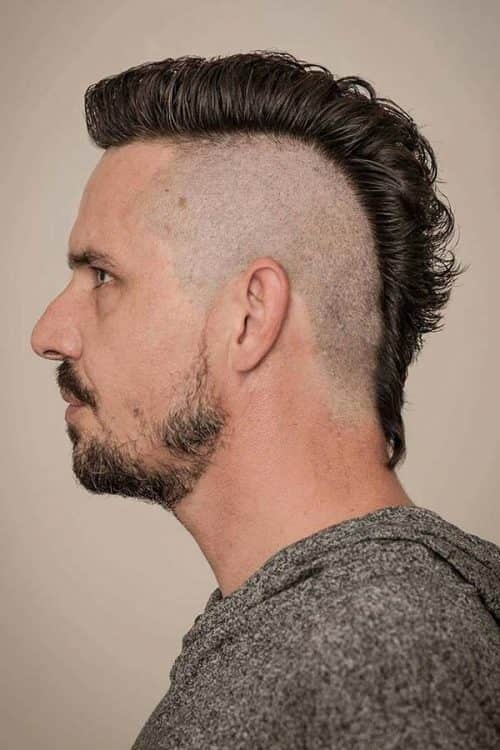 If you are interested in getting mohawk hair, you probably have come across a faux hawk and got confused. Let’s make it clear! 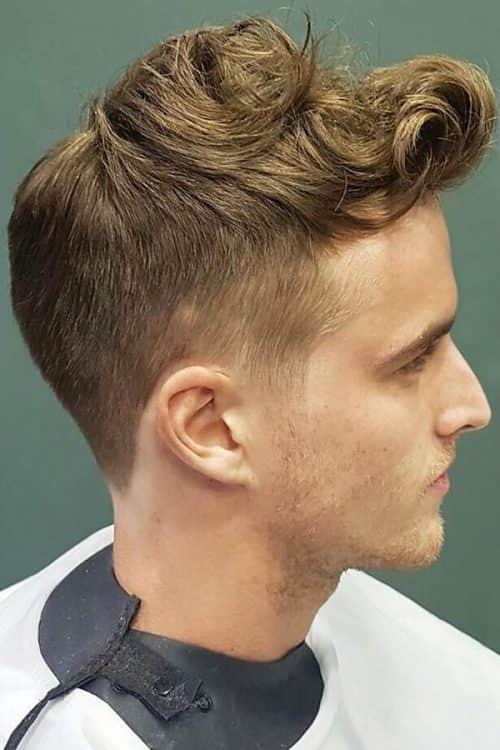 A faux hawk haircut is a soft, less shocking and intense version of the mohawk haircut. This time, the top is shorter than its classic version, yet the defined contrast between short sides and top is present. The sides are usually tapered and faded, and the top is left pretty flexible. It’s a nice idea for gents to want to fit office dress standards or who aren’t ready for the classic mohawk yet. The types of mohawks, as well as their styling ways, are countless. Whether you want it to be short and curly or long and straight, it can offer you a lot of ideas to choose from. It doesn’t matter what cuts and styles you like the most. Today you’ll find a mohawk that will suit your preferences, that’s for sure. We’d like to start from the most popular idea that barbers bring to life every day: the faded mohawk. 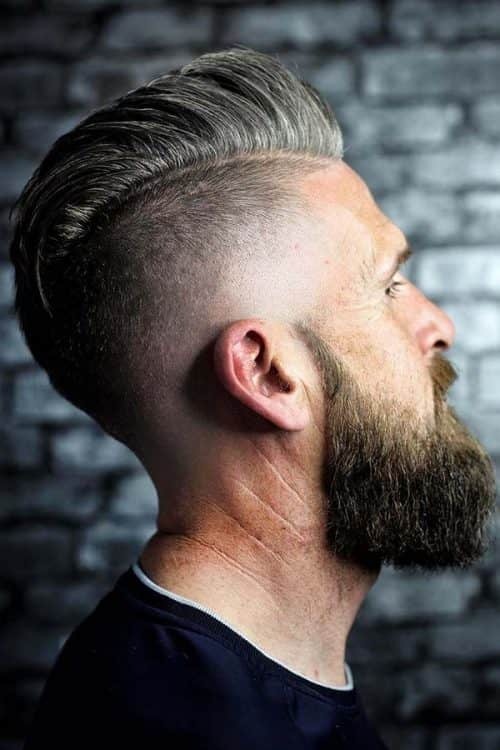 The mohawk fade haircut is all about styling versatility and perfect balance of the overall silhouette, as it involves tapering that turns into a high fade, allowing men to diversify their styling routine and sport it without a shaved head look. 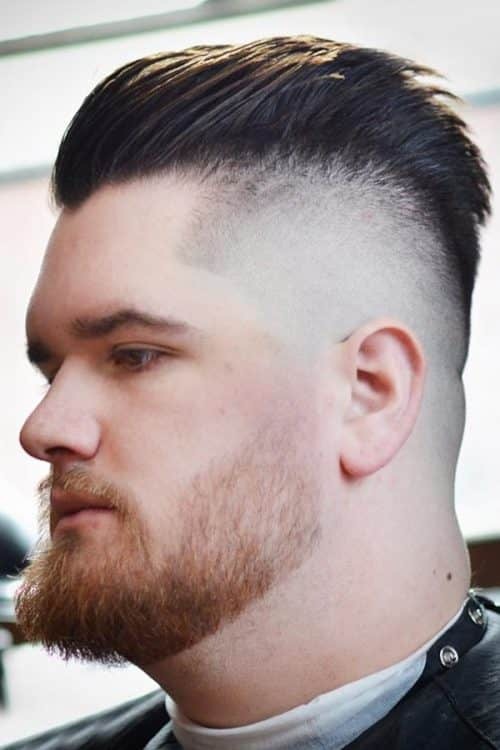 Taper fade works well for modern mohawks. 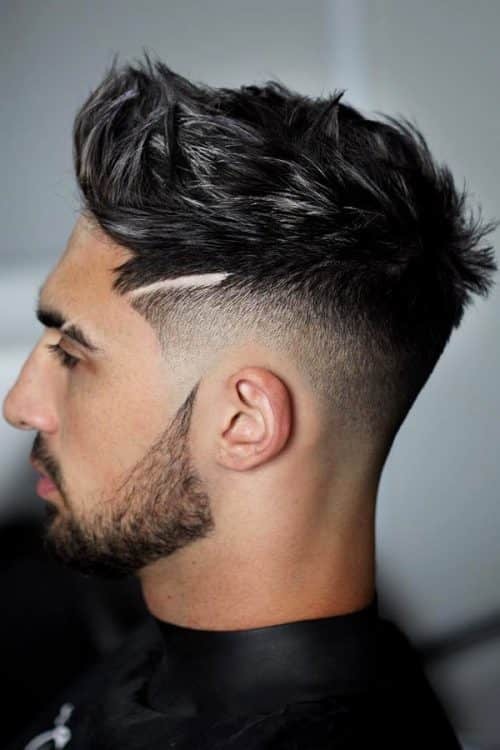 While the top still stands out, the soft taper fade gradually transits from the sides to the shorter hair on the back of the head, taking the mohawk cut to the next, sophisticated level. Not only barbers now that the undercut haircut can be customized as one pleases and also adapt to any haircut. 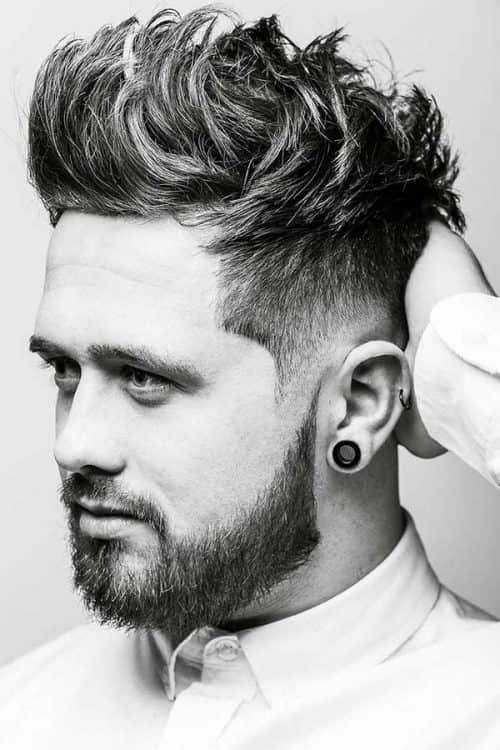 So here comes the undercut mohawk, the sharp and distinctive version of the good-old undercut, where the top is more voluminous, and the sides are totally clean. The short mohawk isn’t so audacious, but it knows how to help its wearer to make a statement, especially if you pair this cut with a beard. 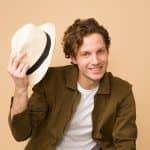 This idea is meant for men who like wearing masculine, pointed haircuts and seek an edgy finish that offers easy maintenance and comfortable look. 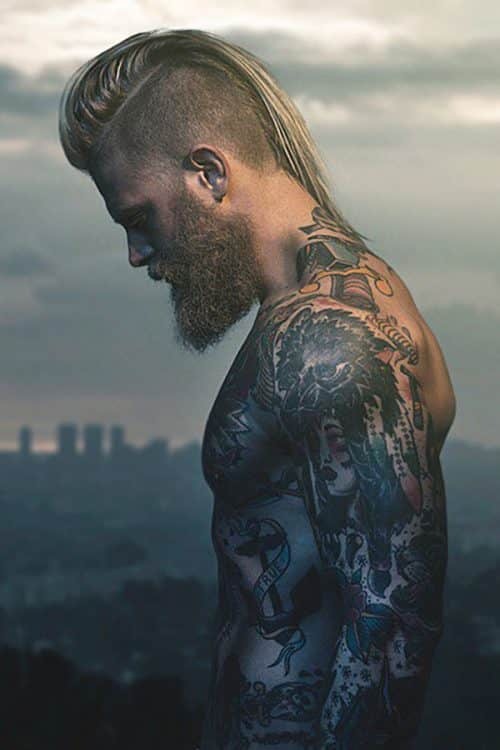 Long mohawk haircut has a lot in common with its classic version: the sides are shaved, and the top is super long. But it also can be different; as different as you want. You can preserve the bold tradition of rock stars and sport a long hair mohawk, but keeping the sides tapered and the top sleek. Keeping up with your daily mohawk hairstyle can be a great deal; it’s a high-maintenance cut, after all. That means that you should fade, shave or buzz your sides regularly. As for the top, for spiky mohawk styles, you’ll need a strong-hold pomade or gel and use some heat to secure the look. And if you want to discover how many mohawk hairstyles you can create, welcome to the inspo-part! Adding a new, bouncy texture is an awesome fresh take at the new today’s trend. The curly mohawk gives a softer and more fascinating look, notably if it’s styled a bit messily or if the top is slightly tousled. Real rock icons love to break the rules, so why don’t you go against the classic mohawk styling and go for an upswept style instead of a spiky one? 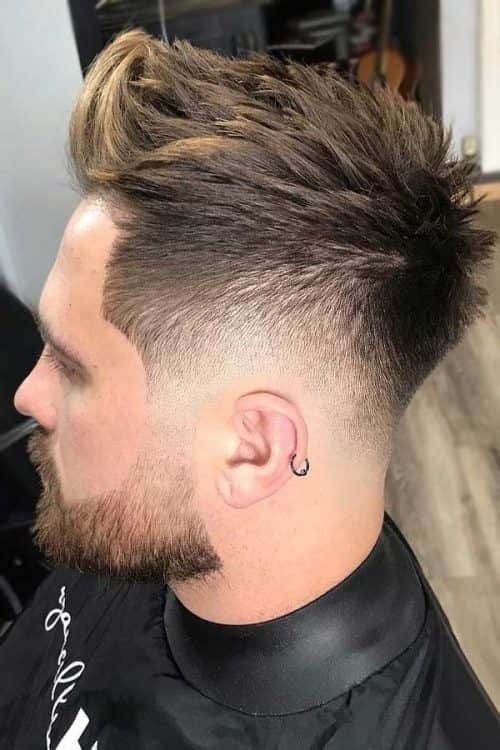 This idea doesn’t really fit the general image of the mohawk cut, but it’s very comfy, stylish, and manful, which is a win-win for businessmen. 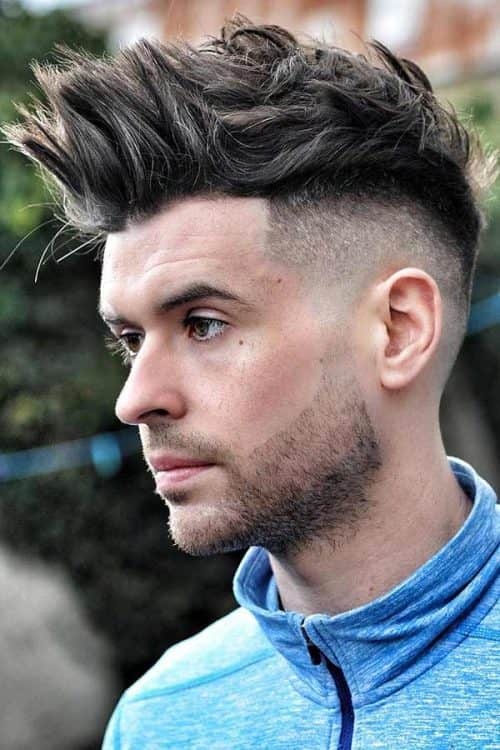 The dramatic, volumetric top of the pompadour hairstyle that meets the impressive bald sides of the mohawk: can you imagine this fancy explosion? Styling your top in a pompadour way will combine the most desired features: your exceptional sense of style and masculinity. 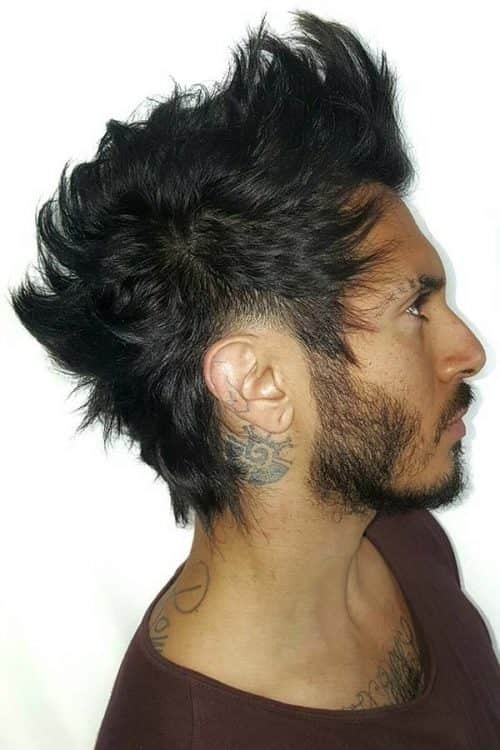 Men who are into grunge sound and styles can style their mohawks messily, emphasizing their shakedown nature. Messy hair gives a sharp, wow-appearance and requires minimum time to get it done. Just like the popular I-don’t-care styles with messy hair men from rock bands sport proudly. If your inner rebel wants to rock your days with spiky hair, the straight and spiky style is a must-try. As you can see, this idea is close to the classic mohawk style, yet the contrast has a sense of modernity that enhances your cheekbones and jawline. Prepare to use plenty of gel; that’s all you need to get the style! Besides asking your barber for a shaved stripe that accentuates the top. 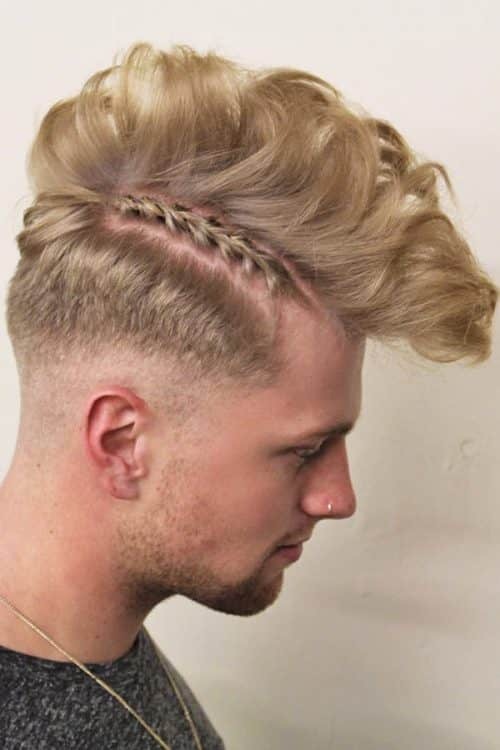 Your mohawk can include a thin mohawk braid near the hairline. Such unique elements as mohawk braids can not only separate the top from the sides visually but also diversify your texture, creating a brand new, elegant style. Nothing can compare to the duo of the unruly, voluminous texture of afro hair and extraordinary appearance of the impactful mohawk. 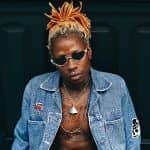 Combining black men haircuts with a hint of mohawk will create a truly bold and stand-out look that fascinates with its contrast and attractive performance. Yes, initially mohawk haircut was too outrageous. But its modern ideas are another proof that everything gets better with the time. Now you know how you can wear, style, and combine the trendy cut. So you’d better call your barber and ask him for some daring changes!